Posted May 8th, 2018 by Matt Doll. 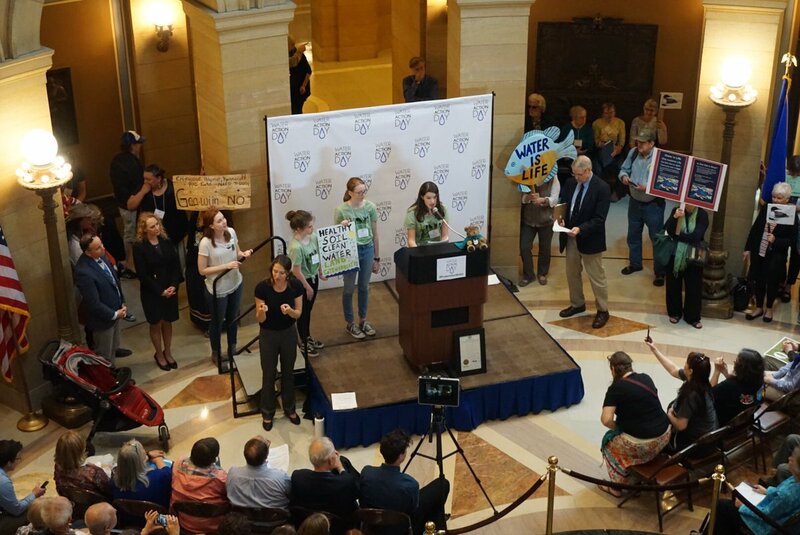 More than six hundred Minnesotans gathered on Wednesday, May 2 at the State Capitol with a critical demand for lawmakers: take action to protect Minnesota’s waters. Hundreds of attendees spoke out on their water concerns, but were united by the belief that the Legislature should work to strengthen – not roll back – Minnesota’s environmental protections. The day began at Christ Lutheran Church near the Capitol, where attendees had breakfast and learned about water issues facing Minnesota. Experts from groups including WaterLegacy, Land Stewardship Project, Friends of the Mississippi River, and the Minnesota Environmental Partnership presented policy briefings throughout the morning. The film Troubled Waters was screened in the sanctuary. Throughout the day, participants shared their concerns in over 140 meetings with legislators. Dozens of students and youth met with members of Governor Dayton’s administration to discuss their water and environmental priorities at the Capitol. 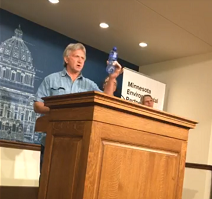 At 12:30, Water Action Day organizers held a press conference at the Capitol featuring farmers and well owners speaking out on nitrate contamination of Minnesota’s groundwater. Steve Morse, MEP’s Executive Director and the author of the 1989 Groundwater Protection Act, described the nitrate crisis that is making Minnesotans’ drinking water increasingly undrinkable. 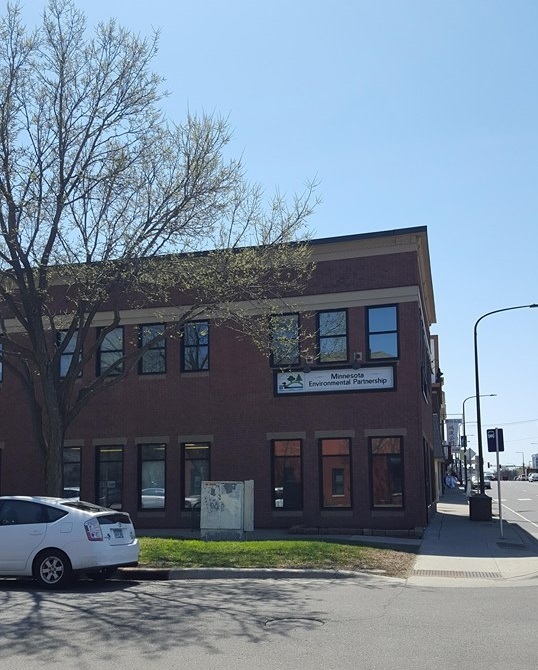 He explained how the Minnesota Department of Agriculture (MDA) is finally developing a framework to implement key provisios of the Act, and the unfortunate effort in the Legislature to derail it. Arlene Nelson, an Winona County dairy farmer and Land Stewardship Project member, told of how nitrate levels in her farm’s drinking water well had risen from 3 ppm (parts per million) to 48 ppm, far beyond the Health Risk Limit of 10 ppm, in 25 years. She traced this alarming development to changes in farm practices in her area with increased corn and soybean production coupled with livestock confinement. Nelson’s family was forced to spend more than $25,000 to drill a deeper well to get safe drinking water – but that is not the solution to our groundwater pollution problem. She argued that the Governor’s proposed Groundwater Protection Rule would save farmers time and money, both on fertilizer and on the enormous cost of water treatment and new wells. Gary Trogstad of Eyota and Representative Clark Johnson of North Mankato spoke to these costs directly. Trogstad lamented that he had to drill an expensive new well due to nitrate contamination, and worried that this well would become contaminated as well if nitrates remained unchecked. Rep. Johnson noted the residents of St. Peter pay significantly higher costs for their drinking water because it needs to be treated when it comes out of their wells. He indicated that the Groundwater Protection rule made perfect sense, especially with most farmers in compliance with the fall fertilizer restrictions already. Dairy Farmer and Land Stewardship member Darrel Mosel of Gaylord shared how he achieves high corn yields without applying nitrogen fertilizer in the fall, and thanked the MDA for working on the issue to help Minnesota lakes and groundwater. 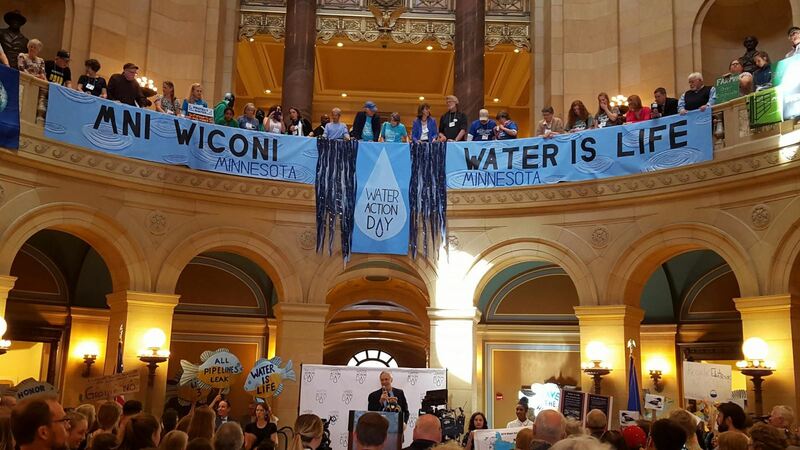 Hundreds of attendees later filled the Capitol rotunda for a clean water rally, emceed by Don Arnosti of the Izaak Walton League and featuring speakers from around the state. Governor Mark Dayton was unable to give a speech as planned, but his Senior Water Advisor, Anna Henderson, presented his proclamation, declaring May 2 to be Water Action Day and recognizing the immeasurable value and unique challenges of protecting Minnesota’s water. Finally, farmers Darrel Mosel and Land Stewardship Project member Audrey Arner spoke on the role of agriculture in protecting Minnesota’s water. Mosel lamented that he and his two sons could not swim or fish in the polluted local lakes in southern Minnesota. He called for good practices to support cover crops and timely fertilizer application to help heal the state’s waters. 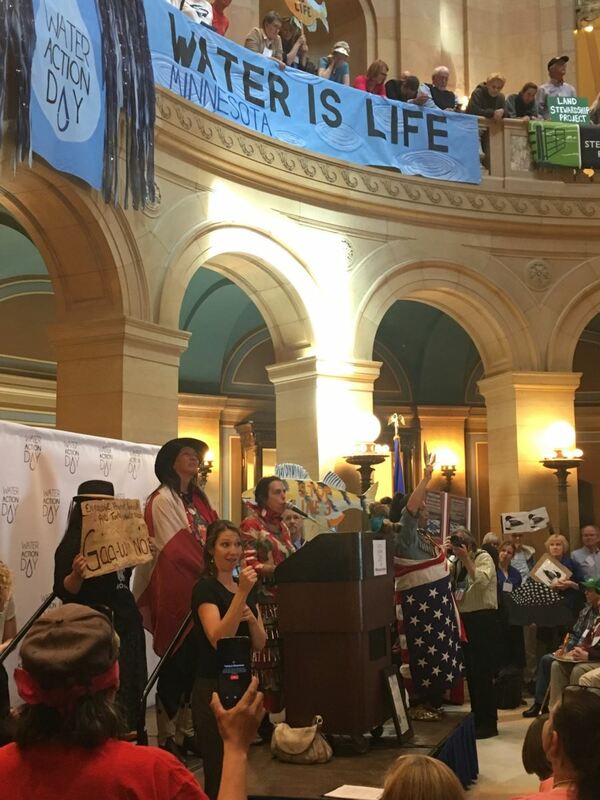 Following the rally, Ojibwe jingle dress dancers performed a ceremonial dance on the steps of the Capitol in honor of Minnesota’s waters. Thank you for joining us, and we hope you’ll help keep up the fight to protect our water! (From Forum of Fargo-Moorhead) — On Minnesota water advocates gathered at the Capitol for their annual Clean Water Action Day when at least one water controversy seems to be easing. House Agriculture Chairman Paul Anderson, R-Starbuck, said Wednesday, May 2, an hour before the clean-water rally that farmers now pretty much accept a Dayton administration draft rule on nitrogen fertilizer, although he said they still do not trust the administration. Hundreds rallied in favor of clean water Wednesday, talking about issues such as sulfate in wild rice water and construction of an oil pipeline across northern Minnesta. But the latest agriculture water controversy was subsiding. Gov. Mark Dayton and key agriculture aides are working on cutting the use of nitrogen fertilizer, which results in nitrates entering water. They have a draft rule to ban its fall application in much of Minnesota. >>Read More. 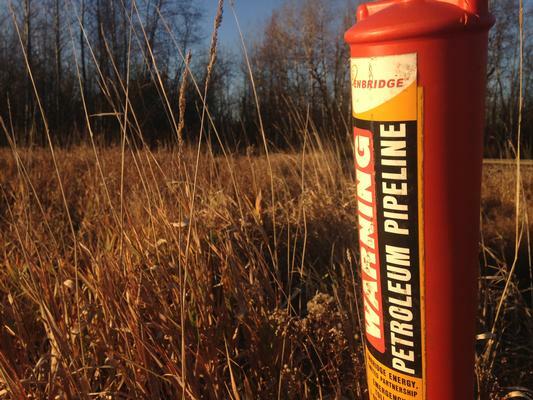 (From MPR News) — County officials in northern Minnesota are worried about large-scale protests if Enbridge Energy gets approval to replace its Line 3 crude oil pipeline, and have asked regulators to find a way to force the company to cover the costs to local governments.Susan Morris, president of the Association of Minnesota Counties, made the request in a letter filed with the state Public Utilities Commission, which is expected to decide next month whether to approve the project and, if it’s approved, what route it should take across Minnesota. The letter, sent late last month, was posted on the PUC’s electronic docket Wednesday. >>Read More. (From Duluth News Tribune) — Superior Mayor Jim Paine and Duluth Mayor Emily Larson are calling on the Husky Energy refinery in Superior to stop using hydrogen fluoride at the site after Thursday’s fire burned within 200 feet of the tank containing the dangerous chemical. 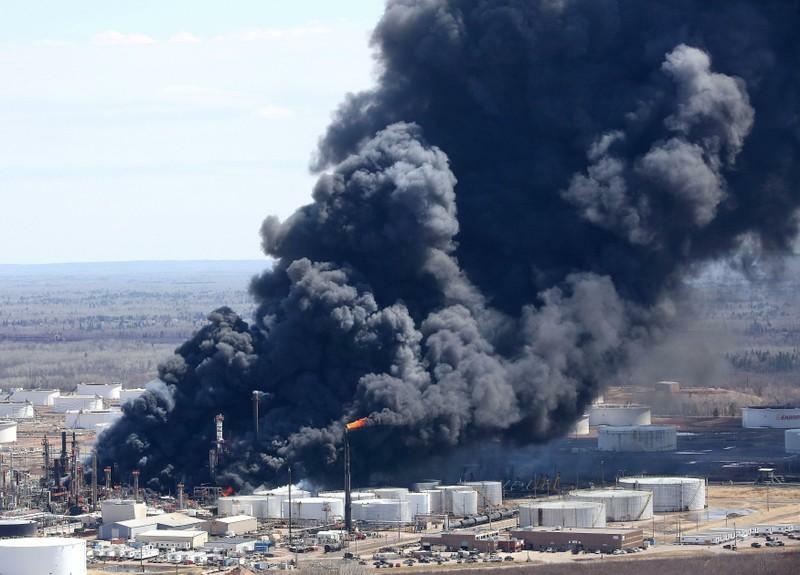 The move comes a day after Paine told the News Tribune that he needed more time to learn about hydrogen fluoride and the refinery process before taking a position on the issue. In a news release Tuesday, Paine said he met with Rob Peabody, president and CEO of Husky Energy, and Chief Operating Officer Rob Symonds, and urged them to stop using hydrogen fluoride, citing concerns from the community. >>Read More. (From MinnPost) — A half-century ago, smoking was a fixture in American life. You could smoke at work, in hospitals, on a plane — not to mention in restaurants and bars, from which the stale smell of spent cigarettes followed you home. More than four in 10 American men smoked, and a third of women did. That began to change after research linked cigarettes to life-shortening illnesses. Over time, more people opted to avoid the risk of breathing smoke that could cause blackened lungs, emphysema and cancer. Today, the share of Americans smoking compared to the late ’60s has been cut by more than half, according to the Centers for Disease Control. >>Read More. 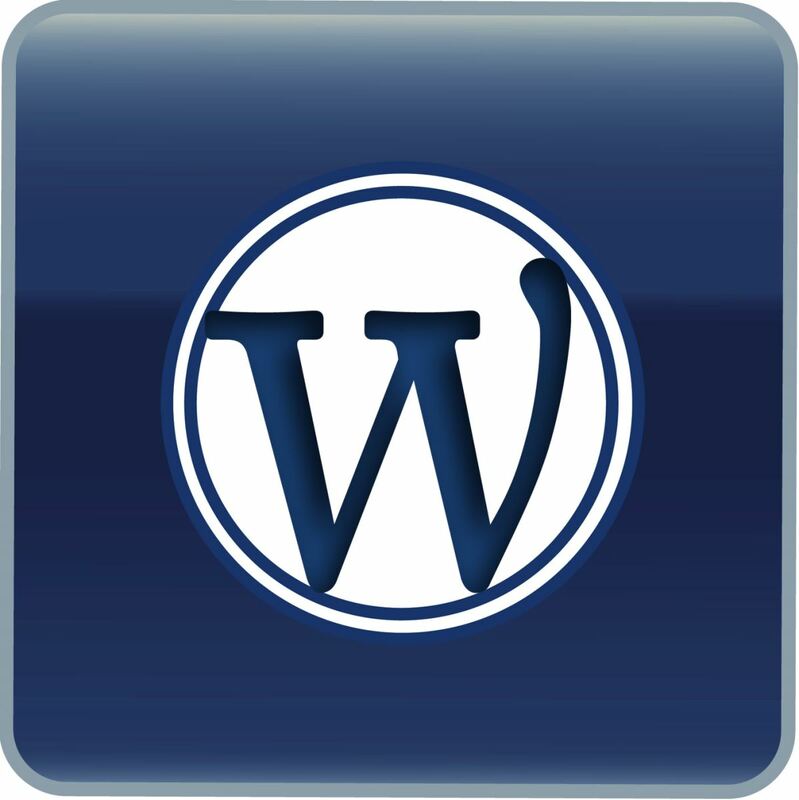 (From the Timberjay) — The U.S. Interior Department announced late Wednesday that it has reinstated mineral leases for the Twin Metals project near Ely. 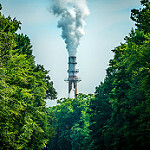 The decision is a reversal of a decision made by the Obama administration in late 2016 and it is likely to face an immediate legal challenge by environmental groups that argue the decision is illegal. The decision runs counter to the expressed view of the U.S. Forest Service, which declined to renew the leases in 2016. 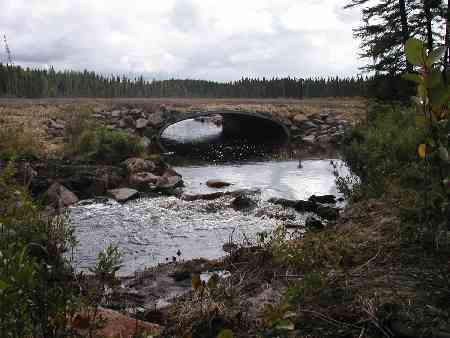 The Forest Service, which is part of the U.S. Department of Agriculture, is continuing a review of a proposed withdrawal of 234,000 acres of the Superior National Forest located within the watershed of the Boundary Waters Canoe Area Wilderness from the federal mineral leasing program. >>Read More. 1. What northern Minnesota city was named after the noble title of French explorer Daniel Greysolon? 2. Name as many of the Native American reservations and communities located in Minnesota as you can. Trivia Answers: 1) Duluth. 2) Bois Forte Band of Chippewa, Fond Du Lac Reservation, Grand Portage Band of Chippewa Indians, Leech Lake Band of Ojibwe, Lower Sioux Indian Community, Mille Lacs Band of Ojibwe, Prairie Island Indian Community, Red Lake Band of Chippewa Indians, Shakopee Mdewakanton Sioux Community, Upper Sioux Community, White Earth Reservation.